An LDLo value is the lowest amount of a solid or liquid material reported to have caused the death of animals or humans. The exposure may be acute or chronic. This is also called the lowest dosage causing death, lowest detected lethal dose, and lethal dose low. LDLo is closely related to the LD50 value which is the dosage which kills half of the test animals under controlled conditions. LCLo (lowest lethal concentration) is a related term used for gases, dusts, vapors, mists etc. Increase workplace safety with colorful safety wall posters from Safety Emporium. The dose may be administered orally (by mouth), injection into various parts of the body (intraperitoneally or intravenously), or dermally (application to the skin). The value is usually reported along with the administration method. Both LD50 and LDLo values state the animal used in the test. This is important because animal toxicity studies do not necessarily extrapolate (extend) to humans. For example, dioxins (of Love Canal, Times Beach, Sveso and Agent Orange fame) are highly toxic to guinea pigs and ducklings at extremely low levels, but have never been unambiguously linked to a single human death even at very high levels of acute (short term) exposure; note, however they are listed by IARC as "known human carcinogens". However, it is best to err on the safe side when evaluating animal toxicity studies and assume that most chemicals that are toxic to animals are toxic to humans. Typical units for LDLo values are milligrams or grams of material per kilogram of body weight (mg/kg or g/kg, recall that 1 kg = 2.2 pounds). 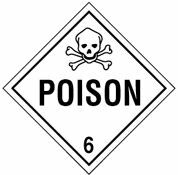 Never be exposed to an LDLo dose of a hazardous chemical -- by definition, there is a resonable chance of dying! Get your DOT hazardous material placards & labels at Safety Emporium. The National Institutes of Health's Intragency Research Animal Committee's Recommendation on LD50 testing (36kB PDF file) is to replace the classical LD50 method involving ~100 animals with a modified approach. The U.S. EPA's Ag 101 entry on LD50. See also: intraperitoneal, intravenous, LC50, mus (mouse), PEL, STEL, TLV.